The BCS is History, Will the Pac-12 Send the SEC with It? It has been fascinating to watch the college football world attempt to justify the myth that the SEC remained, by a large margin, the best conference in the country throughout the 2013 season. In their eyes, this was the only (untouchable) view. This view has survived for a long time, and in fairness there have always been reasonably strong arguments to support it. Over the past decade, the Southeast has been a hotbed of immense talent both on the field and on the sideline. In 2013, however, things were different. While Missouri and Auburn rose and Alabama only lost those two games, other powerhouses such as Georgia, Florida and LSU did not look like themselves. High-powered offenses blew through defenses during shootouts, and all of a sudden the “old-school” SEC was in the midst of an identity crisis. Nick Saban and Alabama have won 3 national titles in the past 5 seasons, but lost the final two games of this past season. With Florida State ending the SEC’s seven-year national championship streak in the final BCS title game, it is time to call this untouchable reputation of the Southeast into question. Why was the SEC college football’s best conference in 2013? Most will say, it’s simple: it’s the SEC. Just look at Auburn, Alabama, South Carolina, and Missouri. But then again, listing teams is not exactly an argument, is it? Oregon, Stanford, Arizona State, and UCLA could just as easily be used to claim that the Pac-12 is the best conference around. To gain proper perspective, these teams need to be compared to other teams outside of their respective conferences. Instead, SEC teams are blindly given credit for just being in the SEC. At a certain point in time, which it seems we’ve reached, that really doesn’t mean anything anymore. Alabama with its ever-relevant “strength of schedule” argument played against only four teams that finished in the Top-25. The Tide lost two of those games, and successfully debunked the myth that it deserves a mulligan to get into the national title game because of its consistent weekly grind. The Pac-12 is known for its offense, but defensive stars such as Ifo Ekpre-Olomu demonstrate its balance. As for Auburn, their wins over Georgia and Alabama came on two of the most miraculous plays in college football history. This is not to take away from Auburn’s fantastic title run, and in fact the team was able to put itself into a position to win those games. However, if not for the “Prayer at Jordan-Hare” and the “Kick Six,” the Tigers would have been happy just to sneak into the Top-25, and few would be using their name to boast the SEC’s 2013 prowess. This also might be a good place to mention the fact that the Pac-12’s own Washington State nearly took down Auburn on the road to open the season. “Seven straight championships don’t lie.” They certainly do not, and I cannot argue with the claim that the best team in the country over that seven-year span came from the SEC. However, ‘best team’ does not automatically equal ‘best conference.’ Do you see anyone ready to crown the ACC after Florida State’s win? For such a strong conference, the SEC seems easy to infiltrate. Missouri and Texas A&M have found enormous success with their relatively fast, innovative personnel and schemes against the ‘bulk’ of the conference after joining prior to the 2012 season. The SEC also seems to get credit for things that the Pac-12 is traditionally dinged for. A questionable hit is a great example of “grown-man” football in the SEC. In the Pac-12, it’s dirty. 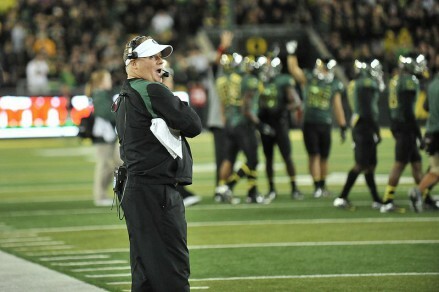 Innovative coaches such as Chip Kelly have given the Pac-12 a large advantage over the past few seasons. Gus Malzahn’s hurry-up attack is wonderfully creative, innovative, and exotic. 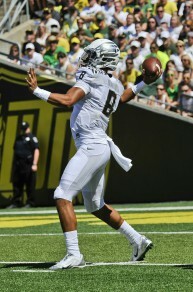 With Oregon’s, it’s a gimmick. And this year, the SEC ate itself alive, something that the deep Pac-12 has become known for. This cannibalization left no teams undefeated in the Southeast, and represented the true depth of the conference. When Pac-12 teams beat up on each other, though, conference prestige somehow decreases. What about the coaches? As brilliant as Nick Saban and Steve Spurrier are, for how long can we really ignore the disparity between their bad luck in the NFL compared to the instant playoff runs of Chip Kelly, Jim Harbaugh, and Pete Carroll — all of Pac-12 heritage? My issue is not with the claim that the SEC remains the strongest conference in the country, for it very well may be. There are few methods at play that allow us to fully eliminate subjective elements from this argument, so we may never know for sure. My issue is with the closed-mindedness. It is with the stubbornness and the condescending attitude that, for whatever reason, is seen as totally okay. Even if the SEC is still the nation’s best conference, which again is an idea that I am completely open to, disrespect is never something I can support. And disrespect is what we have on our hands. A great example of this came earlier this month at the Sugar Bowl. Analysts were all but handing the Tide a blowout win, some even claiming that the Alabama should still be considered the nation’s top team with a win even without playing in the national title game. Well, we all know how that went. Oklahoma outplayed the Tide for four quarters, winning 45-31. 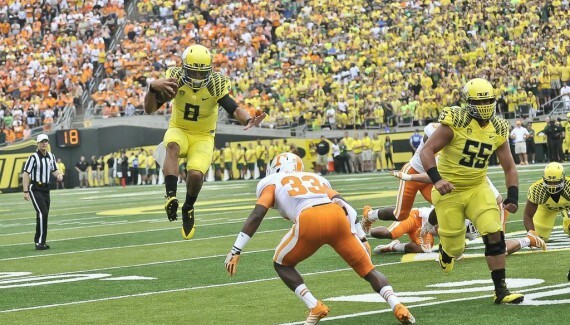 Dynamic quarterback Marcus Mariota will help lead the charge against SEC superiority in 2014. 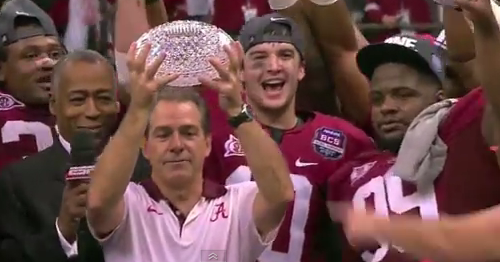 With college football waving goodbye to the BCS, 2014 will be the dawn of a new era. However, this new era will not just be marked by the four-team playoff system. I believe that it will be marked by the end of the blind fantasy of SEC superiority, and a power shift to the West in college football. Stanford, UCLA, Oregon State, Arizona State, and USC have recruited well and do not appear to be leaving the national stage any time soon. Washington continues to intrigue us every season, and should continue to do so with Chris Peterson at the helm, and Mike Leach and Rich Rodriguez have the potential to threaten with Washington State and Arizona. Even Utah proved to be a dangerous wildcard this past season. However, of all of the Pac-12 teams, Oregon is most likely to lead the crusade against the myth of SEC superiority. With their sleek look, high-powered offense, and nearly unstoppable speed, the Ducks are the perfect poster child to lead this paradigm shift. 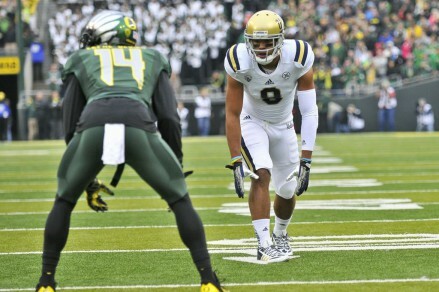 Oregon’s tradition is change, the SEC’s is history, and the innovative Pac-12 is the future.